In a word: Of the people. Nichole ate the chorizo empanada with a macchiato (comped). The bill was $11, or $5ish/person, plus tip. JM gave Victory an A-; Nichole gave Victory an A (see our grading rubric). Victory opened in late summer 2010 but didn't appear on the List until October 2011. As it happens, our post-W make-up visit on Thanksgiving weekend was just 11 days after a large rock bearing a political anti-recall note crashed through the Victory's front window. 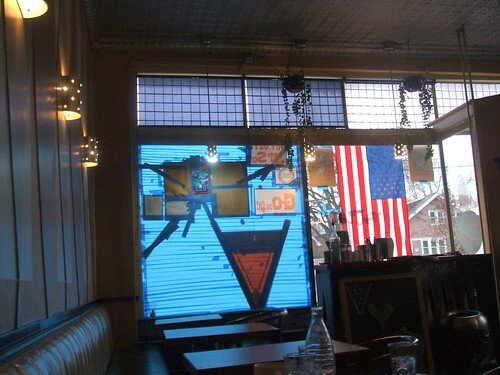 According to the owner, Patrick, the rock was propelled with such force that it hit the back wall of the cafe. Fortunately it was higher than the heads of the customers sitting in the window, and no one was hurt. The window was not covered by insurance. While Patrick wasn't planning to ask for donations, a young customer who was in the cafe that night decorated a jar asking for support. 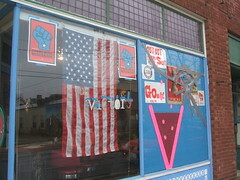 It flooded in; meanwhile, they patched up the window with protest posters and the now-iconic blue painter's tape. It was sort of beautiful. We haven't been back since then because we've been so fixated on getting the list done, but you can bet we would go the distance for Victory. We had a small lunch. Nichole got a macchiato, which Patrick fixed while they talked about the rock and another worker put together JM's panino. Patrick then comped the macchiato because he was concerned that the conversation overrun the espresso's optimum consumption window. It was still perfect. 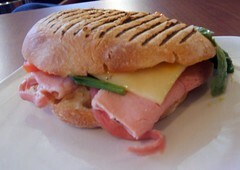 The ham and cheese panino was fantastic, with sweet ham, soft, slightly gritty white cheese (gruyere? ), spinach, and a honey mustard that had a belated horseradish kick, all on an airy/chewy roll. Spotting a familiar, whimsical font on the sign for empanadas, Nichole knew she was in luck. Not only was the Honey Bee chorizo empanada with red peppers and a wee bit of potato almost as good as it had been at Bea's Bonnet, it was served with a spoonful of blood-red hot sauce that might have been Sriracha ketchup. Eating it between sips of coffee felt like accomplishing something, somehow. Looking back now, clearly Victory rose up over those unfortunate circumstances. We hope they continue serving coffee and delicious sandwiches for a long time to come.